Polished stick and numeral indexes mark the minimalist dial of a menswear-inspired round watch feminized by a thin bezel and a slim mesh strap. 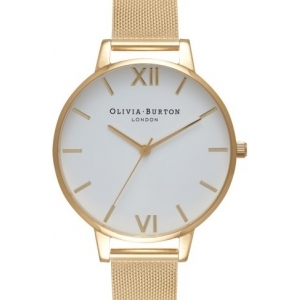 Style Name:Olivia Burton 'Big Dial' Mesh Strap Watch, 38Mm. Style Number: 5194890. Available in stores.